This is the Weis bar for the new age. 1. Beat butter, sugars and vanilla in a bowl until well combined (2 to 3 minutes). Add egg and yolk and cream and beat until pale and creamy. Stir in flour, oats, baking powder and stir to combine. The mixture will seem quite wet. 2. On a flat surface, lay out some cling wrap. Scoop the mixture onto the wrap in a log shape then wrap the log and place in fridge for at least 20 minutes. It will still be quite soft to work with. 3. Preheat oven to 170C and line a large baking tray with baking paper. 4. Cut the log into 1cm thick slices and arrange them on the tray at least 8cm apart – the biscuits spread quite significantly as they cook. Bake for 8 to 10 minutes or until golden. Remove and cool completely. 5. 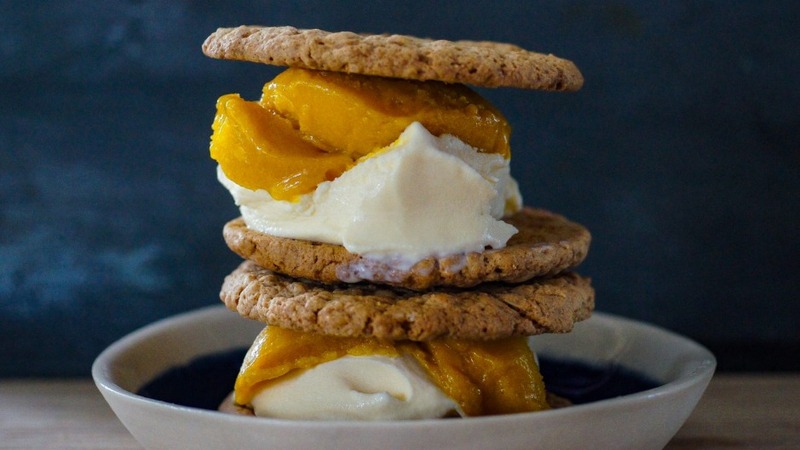 Place a cookie on a flat surface, place a small scoop each of sorbet and frozen yoghurt on the biscuit then sandwich with another cookie. Repeat with remaining biscuits and ice-cream.